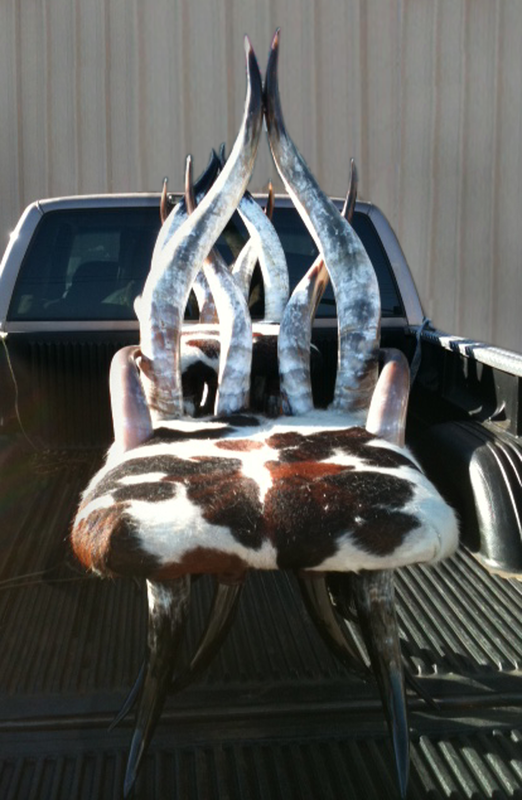 If I were to ask you to imagine a piece of furniture hand-crafted in Texas, the first thing that popped into your head might involve cowhide, horns, perhaps a few spurs...something diamond-studded...and then maybe you would shake your head and think that was a little too obvious. And in this case you would be wrong...sort of. As it turns out, the classic images of Lone Star orient are precisely what Robert Carbajal intended to use as he assembled (from ground-up) what we are affectionately referring to as The Hair on Hide Horn Chair. What started out as a job for a taxidermist was quickly passed, along with the horns, to Mr. Carbajal who retreated to his office in Waco where the creative juices regularly flow. According to our own Tiffany Tolliver, Robert's account manager here at Greenhouse, no one should have been very surprised at the unique concept Mr. Carbajal produced: "I love working with Robert on his jobs and love hearing about the interesting ones that come up. It can be a challenge sometimes, but I enjoy being able to research fabrics for special projects that customers bring to him. If it involves fabric and furniture, I think he will try just about anything!" Obvious skill, and willingness to take on challenges has kept the Carbajal upholstery business in operation for over over 40 years in Waco, since Robert's father started things up in 1973. Aside from the Horn chair, which has been a hit, producing 12 orders from New York to California, Mr. Carbajal regularly builds furniture for charity auctions. Reclaiming frames from garage sales and places like Goodwill, some of his exploits include a chair he covered in canvas and had children paint with their own hand prints, and a pair of wing chairs for Texas A&M he recovered and embroidered with initials which sold at auction for $9k. Keep an eye out for more of Robert's work coming up soon here on the GH blog!